The Joint BAPS/BAPES Congress is getting interactive. The Learning Lab will consist of two theatre style studios, each equipped by our sponsors Storz and 3D companies. It will allow delegates to practice their minimal access and open surgical skills. 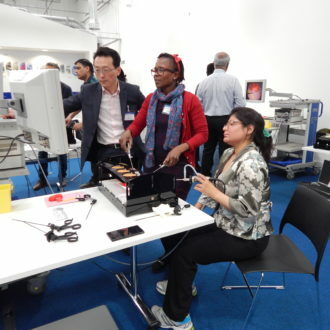 Working in pairs for a period of 1 hour, each delegate will spend half the time operating and half the time assisting under the guidance of an experienced surgeon using specially constructed models. We have a total of 10 slots in each theatre and delegates are encouraged to book their time slots as soon as possible. To book you will need to be registered for the main congress – you will be emailed a booking link or you can contact the BAPS office for the booking link. In addition to the main operating tables, there will be smaller work stations where delegates may practice skills independently. These areas will not require a booking.